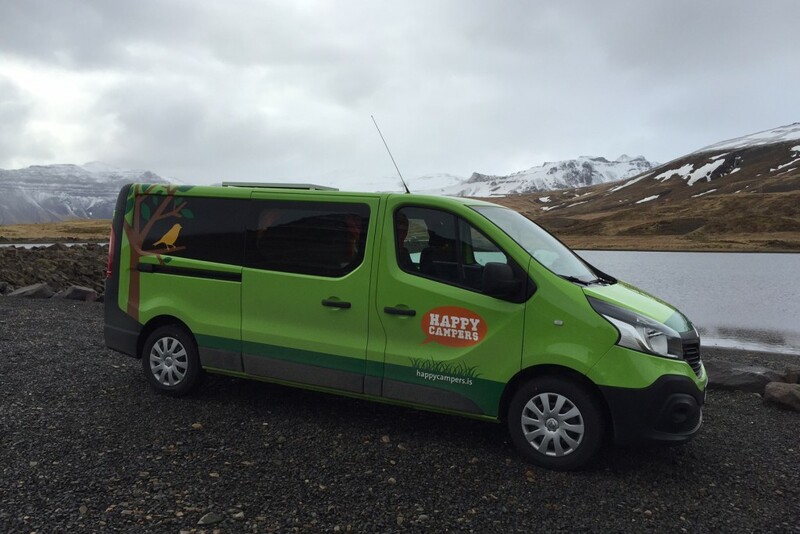 If you are going to travel around Iceland, you are definitely considering a car rental to be completely free during your explorations of all the interesting places that Iceland has to offer. I arrived at Keflavik International Airport around midnight. Personaly it was the best idea to rent a car directly from the airport and return it on the way back. After a brief search of offers, I decided to use the services offered by GO ICELAND, their office is located approximately 500 meters from the airport. You can pay extra charge for the airport pick up service if you like. However, it was not necessary in this case because you will recieve an e-mail before your arrival with a map of the location for the Keflavik walk in office. 1. What type of car is suitable for you when traveling around Iceland? First and foremost, prices in Iceland depend on the travel period. High season is from 1.6. – 31.8. I was in Iceland during the last week of May, so during the off-season. At this time, the car rentals and accommodation as well as the other services are much cheaper. I rented a standard 4×4 vehicle “type Suzuki Vitara”. This means that when you arrive at the car rental offices, they will allocate a car for you, which is currently available. It may not be the exact Suzuki Vitara. We obtained the Dacia Duster instead. You will get the car with the full tank. The same is expected when you return the car. If the car will not be fully refueled on your return, you will be asked to pay a fine. The gas station is directly at the airport so you can easily refuel the car on your way back. When returning the car it is not necessary to wash it or to be vacuumed. However, do not forget to check for damage in the car before you take it. 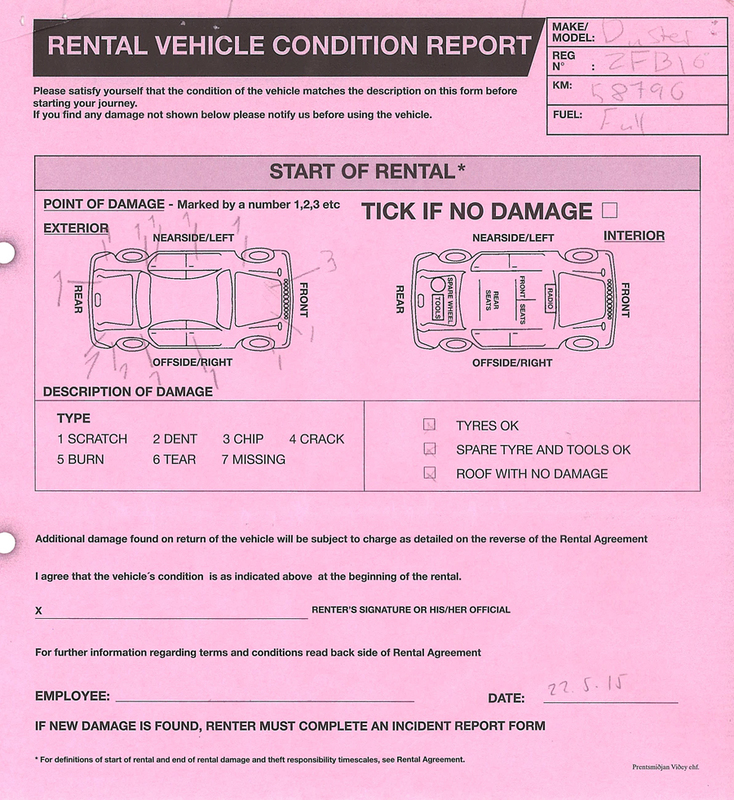 You will sign a document where all existing damages on the car are percisely marked. This will ensure no unnecessary complications at the end of your trip. As I mentioned above, I personally categorized the vehicles into five groups. In the fifth category are also Campers. As you can see, there is an “Renault Traffic”, however, you can sleep in the back of the car. You can stop wherever you want and sleep. Such cars are often seen on the road, I suppose it is a very popular way to explore Iceland without having to plan in advance. The best way is to take a credit card with you. You can pay with your credit card for petrol/diesel everywhere. Although the pumps mostly close around 18:00, but with the credit card you can refuell your car 24/7. However, if you want to pay in cash (ISK), you can buy a prepaid card for 5000 (ISK) (33 EUR) or 10 000 (ISK). 5. 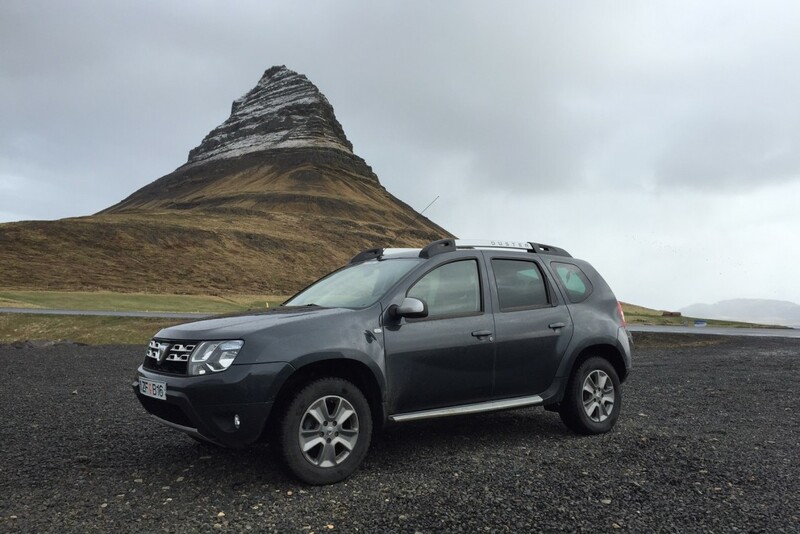 Is it necessary to rent 4×4 vehicle in Iceland? It depends whether you mainly ride on the ring road or you want to drive along the side roads. If you stay on the ring road, it is very unlikely that you will need 4WD car. However, when you turn on the side road and you’ll want to explore the area, it is recommended to use 4×4 drive. Nature in Iceland is so beautiful, why not explore the side roads aswell? With the car we’ve rented – Dacia Duster we also crossed a few small rivers on our way. Although, to be unrestricted, I suggest you rent a car like Toyota Land Cruiser. On the side roads it will often happen that the river is crossing the way and the only way to continue is to drive across the river. If the car is damaged during this, no insurance will cover that, so be careful. The aspect that definitely should not be underestimated is the car insurance. I recommend to pay extra and choose a maximum ” Premium Insurance “. Nothing beats this. As you probably know, the prices in Iceland are high and this applies also for the repairs of the car. This means that if you have the premium insurance, even if the car is damaged you will pay maximum 90,000 ISK (600 EUR). The basic insurance can cost you up to 350,000 ISK (2,333 EUR). This could ruin your visit. As the employee of GO ICELAND confirmed, accidents happen. Whether you are an experienced rider or not, this is a standard precaution. Premium insurance is simply a must have. No insurance covers damages to the chasis of the vehicle or any kind of water damage to the vehicle or the engine. For your safety take special care when crossing rivers and driving on gravel roads. Water damages can cost around 10.000 EUR. Off road driving in Iceland is strictly forbidden. For the entire week traveling around Iceland I didn´t meet a police officer controlling speed limits. Although, there are plenty of speed radars. If the speed camera captures your vehicle exceeding the speed limit, the police automatically send the penalty photo ticket directly to the car rental office. When you rent a car in Iceland, they have access to your credit card and can use it for payments like this. They have the authority to withdraw money from your card without having to notify you in advance. Then they will send you the bill. Handling fee for speeding fines, parking tickets and tunnel fee is 5.000 ISK (33 EUR). 9. Is it safe to drive in Iceland? There is not a lot of traffic outside Reykjavik. It is rare for drivers to exceed the speed limit. Don´t be afraid that people in Iceland are crazy drivers. The ring road is very safe to drive on. Roads are always nicely maintained, there is no need for concern. This also applies to less skilled drivers. Watch a nice video about how to drive in Iceland. My last piece of advice is based on how to navigate around a roundabout. There are plenty of roundabouts in Iceland. In Reykjavik also, and here there is more density of traffic. If you want to avoid an accident, learn how to drive on a two-lane roundabout and who has the right of way. I believe that all this information could help you. I wish you a pleasant time in Iceland, it’s an amazing country. You can read more about my stay in Iceland in my upcoming articles.